This last weekend my family came down from Idaho to visit my grandparents for memorial weekend. It was so great to see my siblings and parents again since I don’t get to see them very often. I love them so much! Saturday I went over to have dinner with them and spaghetti was on the menu which is worrying for a gluten intolerant such as myself but my sister Alexis was thinking of me. She made some amazing gluten free meatballs and some spaghetti squash instead of noodles. It was my first time trying spaghetti squash because as a kid I had labelled squash inedible and avoided it like the plague, but I was pleasantly surprised at how delicious this was. It has a sweetness that really compliments the sauce and the texture honestly could be seen as an improvement over traditional noodles. Traditional noodles have that stickiness that sticks to your teeth and this didn’t have any that. I hadn’t had any type of pasta in about 4-5 months since I originally stopped eating gluten and it really hit the spot. I will post the recipe in the very near future so you can try it. After dinner, my mom took me grocery shopping and bought me these Brazi Bites. On their website you can search the retailers that carry them nearby and you can also order from the company itself if there is nobody that carries them. I cooked some up this week and they are delightful! 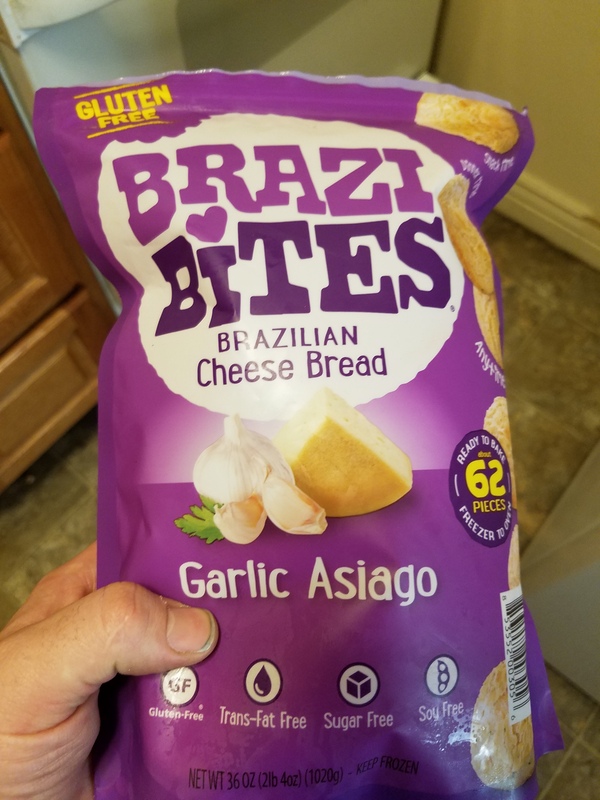 I got the Asiago Garlic and the texture was amazing. The outside has a crunch but the middle is very light and airy. The taste is buttery with a light garlic and cheese flavor. Eating them is fun because I didn’t know whether to just hold them in my mouth and really take my time enjoying them or just gobble them all up like ravenous wolf. Cooking them was quick and easy they are frozen and don’t require thawing, you just pour them onto a baking sheet, cook for 20 minutes until golden and you are ready to go. The best thing about it is that it was gluten free, meaning no wanting to die from horrible stomach cramps, no bad gas, and no hurried trips to the bathroom. My conclusion on these little babies is that they not only are a good gluten free bread alternative but that they are so good that normal gluten filled bread bites fade in comparison. They get a two thumbs up from me! Go to the store and get them right now!